My mother, Diana Lynn Harris, 27, disappeared from Big Pine Key, Florida, in October 1981. I was ten years old at the time. My brother and I were in Michigan, visiting our father. After our mother’s disappearance, our grandmother raised us. When I turned 17, I returned to Florida to begin my personal investigation of Mom’s disappearance. I’ve been at it ever since. Information I’ve recently uncovered leads me to suspect that my mother may have become a threat to an ongoing, major drug operation and that she might not have been the only person to lose her life for that reason. I recently ran names connected to Mom’s disappearance through a search engine. When I ran the name “Mark Ripin” – an ex-convict, who was questioned in regard to my mom’s case -- I landed on the Real Crimes web site. My heart dropped into my shoes when I discovered that Mark Ripin was also questioned as a possible suspect in the “Tom Stump Missing Persons Case,” and that several other individuals linked to my mother’s case are also linked to Tom Stump’s case. On the web site I learned that Tom Stump disappeared from Sugarloaf Key, Florida, in 1995. Like my mom, his body was never found. At the time of his disappearance, Tom was married to Mark Ripin’s ex-wife, Bernie Ripin/Stump. A few days prior to vanishing, Tom was telling people that he suspected Bernie of having an affair with radio talk show host Bill Becker. As soon as she was legally able to do so, Bernie married Becker. I recognized some of the names on the web site and on the message board as people my mom knew back in 1981. Mark Ripin, the ex-con; Mark’s then-wife Bernie; and their attorney friend, Mitchell Denker, were part of a tight knit group of friends who partied together -- and some of whom actually lived together -- during that time period. My mom was introduced to that group by a new boyfriend, Gary Vincente Argenzio, who, I’ve now found out, was another ex-convict and a close friend of Mark Ripin. Mark Ripen was then, and still is, a close friend of Bernie’s fourth and current husband, Bill Becker, who was Bernie’s live-in boyfriend in 1980 and again began living with her after Tom Stump vanished in 1995. In October 1981, Mom phoned a friend in Michigan from a hot tub at attorney Mitchell Denker’s “party house” on Big Pine Key and told her that a big drug drop-off was scheduled and she was afraid the phone might be tapped. She also mentioned guard dogs. That’s the last anybody ever heard from her. I’ve since been told by someone in law enforcement that certain police officers attended functions at that party house and that some lost their jobs because of the activities there. My grandmother filed missing person’s reports in both Michigan and Monroe County, Florida. Nobody at the party house reported Mom missing. One week after Mom vanished, Gary Argenzio stole a boat that belonged to a man named Robert Thompson. Mitchell Denker told me that Gary also stole two motorcycles from him and possibly a gun. Mark Ripin has since told me that he and Denker owned a boat together, and Denker once allowed Gary to take this boat out and Gary ran it with no oil and blew the motor. Is that why Gary took Robert Thompson’s boat instead of Denker’s? Another vehicle that was missing was a car that belonged to Mom’s friend Donna. Donna thought it was taken by a man named “Mark” who lived on No Name Key, which is where Mark Ripin and his wife Bernie lived at that time. However, she also added that she believed that man was Mitchell Denker’s cousin, who worked at Denker’s law office. It’s possible she may have confused Mark Ripin with Mitchell Denker’s cousin, Michael Gilbert, who died of a drug overdose in the ‘80s. Which one was it? 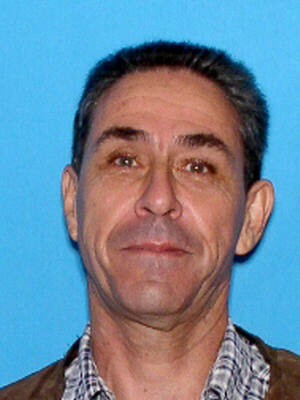 After Argenzio ran off to Mexico, Denker allegedly found Donna’s car on a side road. He has stated that he believes Gary Argenzio took the car, perhaps to transport Mom’s body, and claims to have checked it for forensic evidence and found none. Denker is an attorney, not a forensic expert. Why didn’t he turn the car over to the authorities for a professional work-up? Detective Richard Conrady and Detective Lynn McNeil of the Monroe County Sheriff’s Department were originally the lead detectives in Mom’s case. In June 1995, when Mom’s case was being re-investigated as a possible homicide, Detective Phil Harrold questioned Mitchell Denker. Denker told Detective Harrold that Mom was murdered and suggested that she speak with Argenzio’s friend Mark Ripin. Ripin told him he believed Argenzio killed Mom and dumped her body in the ocean. In July 1982, Gary Argenzio was arrested in Mexico, but he wasn’t charged with Mom’s murder. Instead, (under the name “Gary Vincento”), he was charged and found guilty of stealing Robert Thompson’s boat. Mitchell Denker’s cousin, Michael Gilbert, a member of Denker's law firm, defended Gary Argenzio pro bono. Argenzio was found guilty and sentenced to five years in prison. In May 1990, I contacted Mitchell Denker by phone, and he informed me that he’d sold the party house in 1984. He said he was going to Turkey on business for two weeks and to call him when he got back. When I called him again, he acted like he’d never before talked to me. In 1992, Gary Argenzio was convicted of another felony. Five days later, he died in his Broward County home in Dania, Florida, allegedly of pneumonia. But I wasn’t going to give up. Approximately January 1995, I again contacted Mitchell Denker. This time he told me that he thought Gary Argenzio might have buried my mother in Denker’s back yard. As a result of Denker’s new statement, I was able to convince the Sheriff’s Department to reactivate my mother’s case. When questioned in June 1995 by Detective Harrald, Denker said it would have been impossible to bury a body in his yard because of the guard dogs and the coral. Detective Harrald told me the yard had been cemented over so it could not be searched or dug up. Mitchell Denker asked Harrold if his original statement from 1981 still existed. When Det. Harrold assured him it did not, Denker and Mark Ripin informed him that Argenzio had admitted to smashing Mom’s head into the wall of Denker’s house. Both men stated that they saw the hole in the wall with blood spatters, but Denker described the hole as being in his bedroom and Ripin described it as being by the back door. Detective Lynn McNeil, who investigated the case in 1981, recalled no such damage. She also told me that she and Det. Conrady had checked the woods in the yard for any evidence and had found none. How could the back yard have had woods on it, when Denker said it was solid coral? In July 1995 – at approximately the same time my mother’s case was reactivated – Tom Stump disappeared from his home on Sugarloaf Key. The Monroe County Sheriff’s Department was investigating both the Stump case and Mom’s case simultaneously and was interrogating Mark Ripin in regard to both missing persons cases. Yet apparently nobody found anything the slightest bit suspicious about the fact that the same man was linked to both cases. 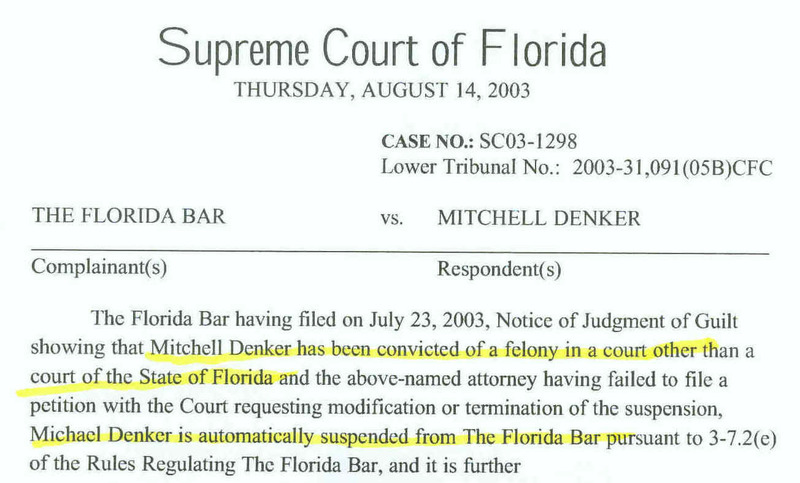 In the summer of 2003, Mitchell Denker was convicted of two felonies -- Transporting Monetary Instruments and perjury. He was sentenced to five months in prison and disbarred in the state of Florida. This proof that Denker was as much of a crook as Mark Ripin and Gary Argenzio caused me to start wondering if all three men might have been involved in my mother’s disappearance. I immediately requested that Detective James Norman of the Monroe County Sheriff’s Department provide me with reports from their 1981 and 1995 investigations. Det. Norman informed me that the files from 1981 did not exist. I was not surprised to hear this, because my Grandma had been trying to get those files for years and had been told they didn’t exist. I was stunned, however, to be told now that former Sheriff William Freeman had deliberately destroyed all case files from the years 1981-1983 and some from 1984. Det. Norman said he couldn’t say why for sure, but had heard a rumor about a big drug bust called the “Big Pine 29” that occurred on Big Pine Key during that time period. Mitchell Denker was the defense attorney for one of the suspected drug smugglers. I contacted Sheriff Richard Roth to ask him about Mom’s files. Sheriff Roth told me that, in 1981, he was a detective and remembers this incident. He said it wasn’t an uncommon thing back then for the Sheriff to get rid of old case files. However, when Mom’s files were destroyed they were not old at all! My Grandma was still communicating with detectives about the case. Someone else posted a quote from Bernie’s deposition in which she admitted to living in Mitchell Denker’s house. Since Bernie was married to Mark Ripin at that time, that would seem to suggest that they both were on the premises when Mom vanished. Bernie has since told me she knew my mom and my mom showed her photos of my brother and me. Yet, Bernie didn't bother to report Mom missing, even though Bernie's own husband said he saw a hole in the wall that was made by Mom's head. Another thing I find bewildering is that, when requestioned by police in 1995, Mitchell Denker -- a practicing attorney who should know the law -- stated that in his opinion there was more than enough evidence to indict Gary Argenzio for my mom's murder, but the Sheriff’s Department hadn’t seemed interested in pursuing it. He specifically cited Mom's disappearance and missing body and Argenzio's flight with Robert Thompson’s boat. Yet, back in 1982, when Argenzio was tried for stealing that boat, Mitchell Denker’s cousin, a member of his own law firm, defended Argenzio for free, and nobody even mentioned my missing mother. In fact, Mark Ripin testified in Argenzio's behalf. My mom was a wonderful mother, and I loved her dearly, but she led a difficult life. After an abusive marriage that ended in divorced, she witnessed her brother shoot himself in the mouth. She attempted to self-medicate by smoking marijuana, but that did little to erase the gristly vision. She relocated to Florida in an effort to escape that awful memory, and continued to smoke marijuana. But she never used hard drugs until she met Gary Argenzio, and I doubt that she had any idea what she was getting into when she started her association with that group of people. I had my mother for only ten years, but I thank God for every one of them. I have beautiful memories of my life with her. She worked hard, cooked wonderful food, and was never too busy to play with my brother and me. She was a very affectionate mother and, no matter how tired she was or how weighed down by worries, she gave us unstinting love and attention. My mom was my world. For 25 years I’ve been trying to find out what happened to her, and I will not stop until I get an answer that makes sense.